Is that double vision or are there two canines where there should only be one? Like humans, cats and dogs have two sets of teeth in their lives. Puppies and kittens initially develop a set of teeth referred to as the deciduous teeth. As permanent teeth develop within the jaw, the roots of the deciduous teeth are resorbed (broken down by the body). This process of losing the deciduous teeth and eruption of permanent teeth is usually complete by 6 months of age. 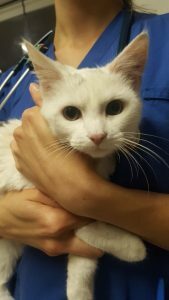 A retained tooth, like this lovely kitty who visited us recently had, occurs when the tooth root does not resorb properly. When this happens, the baby tooth occupies the place in the mouth that is meant for the permanent tooth, forcing the permanent tooth to erupt at an abnormal angle. Food can also get trapped between the two teeth which can cause problems such as tartar deposits, tooth decay, gingivitis and periodontitis, all of which can lead to premature loss of teeth. The most common teeth to be retained are the canine teeth. No two teeth should be in the same socket at the same time. If you notice a retained tooth in your pet’s mouth, make an appointment for an examination. Early extraction will allow the adult teeth to move into their proper positions.